As dramatic video footage is shown daily from the island of Hawaii of lava flowing, new fissures opening and ash plumes, Hawaii Governor David Ige reassured people worldwide that Kilauea volcano is being closely monitored and stated emphatically: "Travel is safe to the Hawaiian Islands." Governor Ige noted, "We have a skilled contingent of scientists, geologists, meteorologists, and health experts whose work is being supported around the clock by emergency officials and law enforcement personnel from federal, state and county agencies. They are continuously scrutinizing the activity within Kilauea volcano and providing clear, carefully thought-out advice with the purpose of keeping the public safe and informed. "This is a time to listen to the experts on-site and to trust what they are reporting and recommending. The experts are telling us there is no danger from the eruptions to anyone outside the areas that have been evacuated. There is no threat of a tsunami. Air quality is being closely studied and is of most concern in the immediate area inside where the volcanic activity is taking place. "Our foremost concern is for the residents in the affected communities. They are receiving all available support from government agencies and officials to cope with the volcano activity and carry on with their lives as best as possible. "Visitors to Hawaii can be assured that the volcanic activity is having no effect whatsoever on the other islands, Oahu, Maui, Molokai, Lanai and Kauai. Visitors can book their trips comfortable in the knowledge that their vacation experience will provide all the enjoyment they expect when coming to our beautiful islands. "All of Hawaii is open for business and welcoming visitors with the hospitality, aloha, warmth and picturesque settings visitors seek in our islands. This includes Hilo, Pahoa and the Kona and Kohala coasts on the island of Hawaii. The one area that people need to avoid is lower Puna where the eruption is ongoing." George D. Szigeti, president and CEO of the Hawaii Tourism Authority, added that travel to and within the Hawaiian Islands is unimpeded by Kilauea volcano. "Summer is just a couple of weeks away and there is no reason for travelers to delay in booking their vacation plans. The number of flights serving Hawaii has never been greater and there is an abundance of choices for travelers to select in choosing the accommodations and activities they want to enjoy in the Hawaiian Islands." Kilauea has been an active volcano since 1983 and is one of Hawaii's most popular attractions. Over the years residents and visitors have been drawn to the wonder of seeing nature at work in the creation of new land via tours or visits to Hawaii Volcanoes National Park. Most of the park is currently closed until further notice. The Hawaii Tourism Authority is responsible for strategically managing the State of Hawaii's marketing initiatives to support tourism. HTA's goal is to optimize tourism's benefits for Hawaii, while being attentive to the interests of travelers, the community and visitor industry. Established in 1998 to support Hawaii's leading industry and largest employer, HTA continually strives to help ensure the sustainability of tourism's success. 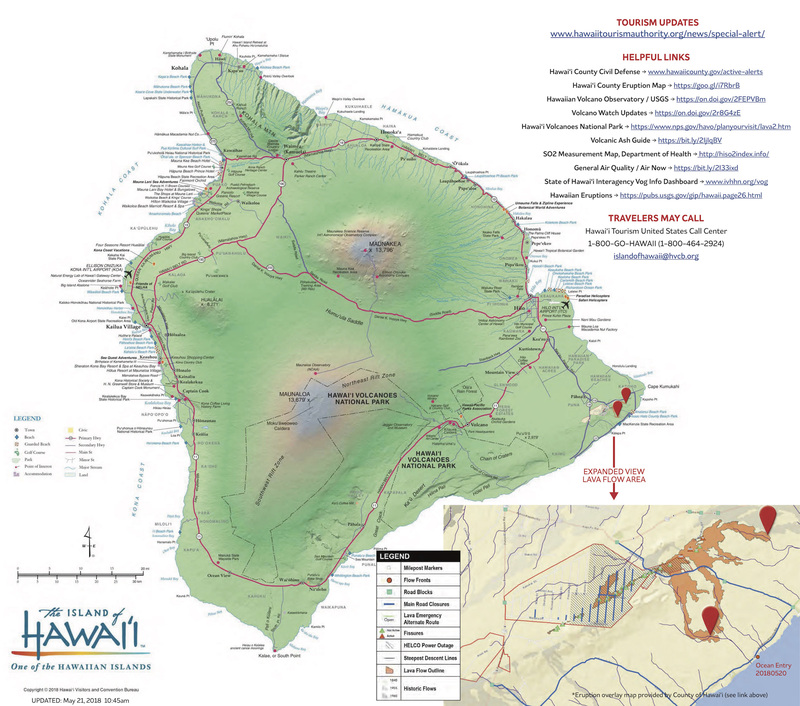 Image caption: Map of the island of Hawaii, which includes an expanded view of the lava flow area. 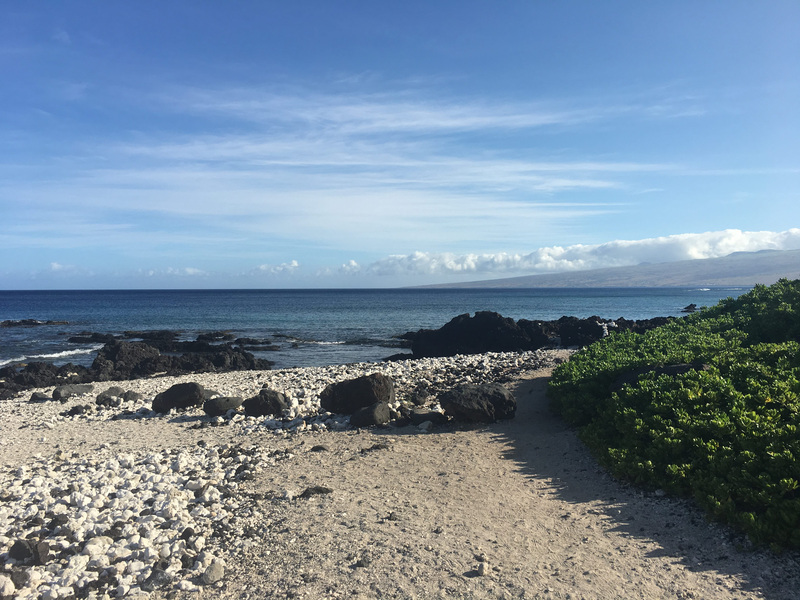 Image caption: Photo of the Kohala Coast on the island of Hawaii taken this morning.